When approaching Maui by air, it’s immediately apparent that the island is filled with extreme varieties of landscapes. From the verdant, rolling hillsides to the waves thundering against the hard volcanic cliffs to the roads that weave their way across and around the island. The best way to really see the island, though, is to get onto it! 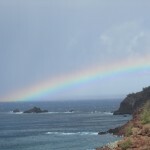 There are two famous drives in Maui: the famed Road to Hana and the West Maui drive. Both are filled with those winding, hilly, cliff-hugging roads, and both offer very different, very dramatic and breathtaking vistas. Whichever drive you choose — or even if you choose both — be sure to carve out several hours so that you can really take your time to enjoy all of the stops along the way. When we drove the Road to Hana, we didn’t have much time so making any stops was impossible. The road is very lush, winding through the hills and valleys of the eastern side of the island with occasional glimpses of the Pacific Ocean. At the end of the road, and after a slightly perilous 10-minute cliffside hike, we found ourselves at the Red Sand Beach, or Kaihalulu Beach (the Hawaiian name). There’s a swimming area that’s naturally protected from the crashing ocean just beyond, creating a kind of wave pool. A terrific way to spend an afternoon — if you have the time! The West Maui drive couldn’t be more different than the Road to Hana. Rather than lush and tropical, the west side of the island is arid and pretty much void of any plant life, but still incredibly beautiful in its own right. The twist on this drive is, there comes a point on the north side where the state road ends and an unmaintained road begins. Rental car agencies aren’t too keen that their cars be driven on that road, but that doesn’t mean it doesn’t happen. Regularly. Of course, with my behemoth of a car, I didn’t even attempt to make the drive, rather stopping at the end of the state road and turning around. There are plenty of highlights to stop and see along the West Maui drive, including dramatic overlooks, watching surfers and snorkelers far below, and the Nakalele Blow Hole, which requires a small downhill hike and a bit of a sense of adventure; remember, the hike is uphill on the way back to the car! An ocean lover, I couldn’t wait for my Coastal Walk and Tidepool Exploration with Jean-Michel Cousteau’s Ambassadors of the Environment, based at the Ritz-Carlton, Kapalua. Our naturalist, Chelsea, led my friend Nancy and I along Maui’s western coastline, pointing out nuances of the landscapes, sharing Hawaiian folklore about flowers and plants found along the path, and telling us bits about the history of the island and Hawaiian culture.When we got to the tidepools along Kapalua Bay, that’s when I reverted to being a kid again. And it was fantastic! We crept along the volcanic rock, peeking into the flowing pools and the world below where tiny fish and crabs make their homes. Chelsea was fantastic, finding creatures to show us, and then putting them gently back into their environments. The find of the day was a shingle urchin — it didn’t look real! I’d never seen anything like it! Simply incredible! After our coastal walk and tidepool exploration, Nancy and I walked out to the Dragon’s Teeth on Makalua-puna Point — more incredible volcanic formations, and also sacred Hawaiian ground. Mesmerizing! Maui is just 727 square miles, but there’s so much to see and do, this is but a very small sampling. I can’t wait to return and explore the island even more! Most times, the only way I experience a place by air is when I fly in. But not during my recent trip to Maui! During the week I was on the magical island, I had the chance to experience the island by air – in three different ways!